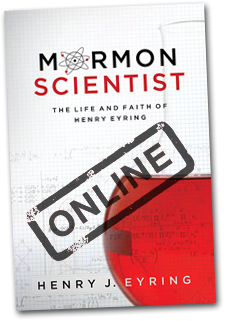 Henry J. Eyring was named after his father, Henry B. Eyring, who was named after his father, Henry the Mormon Scientist. Henry J. shares more than just a name with his grandfather, having followed in the family tradition of learning and education. Henry J. Eyring was born in Palo Alto, California, on September 19, 1963. He earned a Bachelor of Science in Geology from Brigham Young University in 1985 and subsequently continued at BYU, receiving MBA and JD degrees. He was an editor of the J. Reuben Clark Law Review. From 1989 to 1998 Henry worked for Monitor Company, a global management consulting firm in Cambridge, Massachusetts. From 1998-2002 he was director of the BYU MBA program. He then served as president of the Japan Tokyo North Mission for The Church of Jesus Christ of Latter-day Saints from 2003-2006. He is currently an administrator at Brigham Young University–Idaho, a strategic advisor to Peterson Partners, and a director of SkyWest Airlines. He and his wife, Kelly, are the parents of five children. They live in Rexburg, Idaho.